It’s been a rough year for the Yankees. First they lose four-fifths of their opening day starting rotation to injury, and now the first two years of the franchise’s existence have been erased from the team’s record book at baseball-reference.com. Before Monday, baseball-reference.com had recognized the 1901-1902 Baltimore Orioles as the predecessors of the current day New York Yankees. However, with the franchise approaching milestones like 10,000 wins and 15,000 home runs, the repository of baseball’s past decided to do an about face. Convinced in large part by MLB historian John Thorn’s argument against franchise continuity, baseball-reference severed the roots of the Yankees organization by removing its Orioles years from the team’s legacy. Are the 1902 Baltimore Orioles antecedents of the Yankees or not? Thorn’s argument is summed up by a comment he posted on baseball-reference: “When [a] franchise relocates under the same ownership an[d] the [with a] great majority of its players (1958 Dodgers and Giants, 1953 Braves, etc. ), the franchise is continuous. If not, not.” Otherwise, Thorn argues, we’d have to assume continuity for other relocations, such as the N.L.’s replacement of the Troy Trojans with the New York Gothams in 1883. Seems pretty simple, but is such a hard and fast rule appropriate for situations that are often very complex? Because the circumstances surrounding many of the franchise movements that took place early in baseball’s history can be convoluted, an individualized examination seems more appropriate. Baseball history at the turn of the century was filled with intrigue and betrayal. Not only were the American and National Leagues at war, but individuals within the leagues, and even teams, were often conspiring against each other. Against this backdrop, American League President Ban Johnson endeavored to place a team in New York, which, not surprisingly, the incumbent Giants of the National League did everything possible to thwart. Although Johnson wasn’t able to establish a franchise in New York when the A.L. ramped up in 1901, his ultimate plan was to eventually move an existing team into the Big Apple. By many accounts, the Baltimore Orioles were that team. John McGraw was selected to manage the Orioles in 1901, and, he believed, eventually shepherd the team to New York. However, when he learned that Johnson’s plan to reach Gotham didn’t include him, McGraw decided to write his own ticket. Not only did the fiery manager jump ship to the New York Giants in the middle of the 1902 season, but he helped his new bosses gain a majority ownership stake in the Orioles, which he then used to sabotage the franchise. This subterfuge eventually put the Orioles on the brink of collapse, and only by Johnson seizing the reigns was the team able to complete the 1902 season. Then, after negotiating a peace settlement with the National League during the offseason and securing a site for a new ballpark, Johnson folded the tents in the Baltimore and brought his show to the big top in New York. 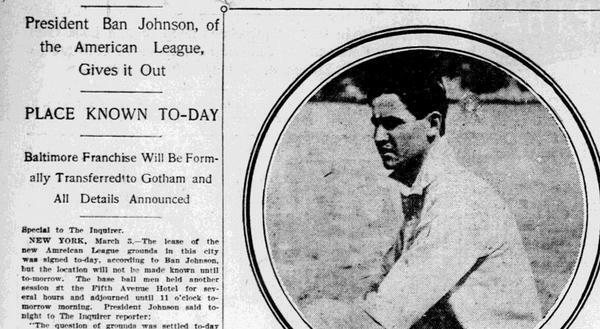 Thorn’s argument against the continuity between Baltimore and New York rests on the basis that team was “forfeited to the league” on July 17, 1902, months before the announced intention to establish a team up north. This gap, Thorn argues, breaks the chain, and essentially amounts to one franchise folding, and another being inaugurated in its place. To further support that claim, Thorn points out that only a handful of players from the 1902 Orioles found themselves playing for the 1903 Highlanders. Because direct ownership wasn’t transferred, nor was the roster kept mostly intact, Thorn argues that the Orioles and Highlanders were two distinct organizations. Even using Thorn’s litmus test, the argument against connecting the dots has flaws. After all, when McGraw effectively assumed control of the Orioles, he raided the roster, which caused other teams to supplement the Baltimore franchise, leaving very few players beholden. Also, the reserve clause was not instituted until after the 1902 season, and player movement during that off season was largely decided by the “peace treaty” between the two leagues. Besides, it was Johnson’s intention to have the New York franchise be competitive, so retaining the same players who went 50-88 probably wouldn’t achieve that goal. Ban Johnson was boss of the A.L. in more ways than one. Another argument in support of continuity centers on Johnson’s early intentions to move the Baltimore franchise to New York. After all, this was a long coveted move, not one borne out of the chaos that took place in the middle of 1902. Almost all historians agree that Johnson had been eyeing New York since the A.L. made itself into a “major league”, and there is also considerable evidence to suggest that the Orioles were the intended franchise that would be transferred. Just because McGraw’s pre-emptive shenanigans threw a monkey wrench into the plan by forcing Ban Johnson to assume control of the franchise doesn’t mean it wasn’t ear marked for New York from the beginning. Considering the prevailing belief that the Orioles were ticketed for the Big Apple, it’s no surprise that the $18,000 paid by the Tammany syndicate has been regularly described as sale of the Baltimore franchise, including, interestingly, by Thorn himself. A case can definitely be made that extenuating circumstances led to the Baltimore Orioles and New York Highlanders becoming distinct business operations from a legal perspective. The Baltimore team was eventually placed in receivership, so none of the assets and obligations were transferred to the New York franchise. That’s pretty close to an open and shut case from a legal standpoint, but Johnson wasn’t fighting for the meager assets of the Orioles. His mission was to land a franchise in New York, with or without nominal ownership, meaning only one asset had real value: the right to operate as a franchise. This asset was retained by Johnson and eventually conferred to new owners. Had McGraw not instigated a coup, it’s likely that the transition would have preceded more smoothly and with legal blessing. That it did not shouldn’t erase the clear ties that bind the Baltimore Orioles of 1901 to 1902 to the Yankees of the present day.